The Holly & Ivy Scarf & Wrap are just the thing to chase away the cold drafts of December while you’re making merry – or to give to someone you love to share the merriment! 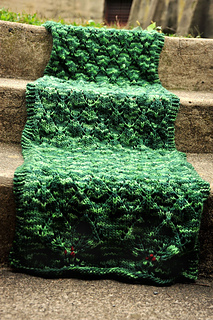 Knit in Malabrigo Worsted (or any worsted weight yarn) in a color that echoes the greens of holly and ivy, the pattern becomes an indulgent wrap for parties or unwrapping gifts. Use Holiday Yarns’ Sock Flock (or any sock weight yarn) and the design becomes a scarf perfect for shopping expeditions and caroling. Make one for yourself, or make both and share one with a friend. 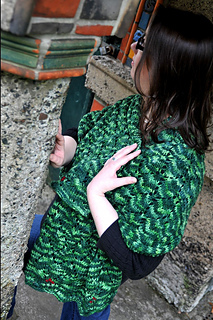 This pattern includes instructions for both the scarf and wrap versions -- two patterns in one! 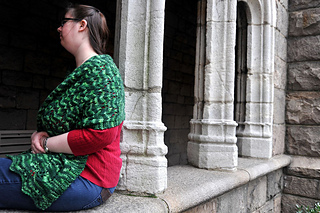 You should be comfortable with lace knitting and reading charts, or looking for a pattern to learn on. The holly berries are formed with French Knots, so you will need some scraps of red yarn in a matching weight to form your holly berries -- or get creative! 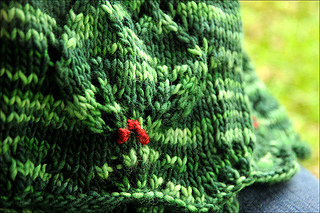 Errata, 11/30/09: A very kind knitter has let me know that there’s a mistake on the Ivy chart. Row two has a double decrease that should not be there. That stitch should be a purl. Again, updated will be released as soon as possible, and my sincerest apologies!